My Chronicle Book Box is a unique reading box curated in the UK every three months containing the latest literary releases from your chosen genre and a selection of beautifully crafted associated items, exclusive to My Chronicle whenever possible. Read on for more on the story behind our subscription book boxes business. The driving force behind My Chronicle is me, Louise. Hello there! I'm involved in every part of the process of providing the subscription book box service from reading the potential books to mailing the boxes. 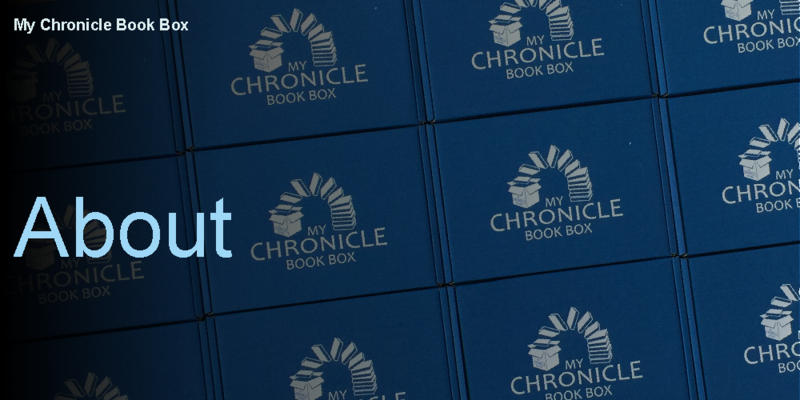 Whatever has inspired you to consider a My Chronicle Book Box subscription, we will take the strain and provide you or a loved one with a wonderful book box every quarter. My Chronicle Book Box will put in the hours reviewing, shortlisting, considering publishing schedules and ultimately selecting top books in the genre of your choice and compliment them with a range of hand-picked related treats for the ultimate reading box experience. On the appointed date we will send it direct to the address you provide. What inspired me to create my own book box business you ask? I am a devoted book lover and spend much of my spare time reading and reviewing a wide variety of books. I also love the whole idea of subscription book boxes and have watched and read about many unboxings on social media. And yet I had never subscribed to one. I got to wondering why not and realised that the majority of the unboxings I had seen were focused on young adult fiction and that many of the subscriptions available from the UK were not focused on my favourite genres. The majority of the books on my bookshelves are crime and mysteries or science fiction and fantasy based. From the nebulous idea that I would like a book box tailored to my interests the idea for My Chronicle Book Box grew. I began thinking about what I would like in my own book box and through chatting with friends and family I found I was not the only one who would like to buy such a box for themselves or as gifts for others. Couple this with my long held desire to run my own business and here I am launching my own book box to share with the world. My Chronicle Book Box are proud to have put in the hours reviewing, shortlisting, considering publishing schedules and ultimately selecting what we think are the best books for your book box. We compliment the selected books with a range of hand-picked related treats for the ultimate reading box experience. Feel free to have a look around our subscription book box homepage for yourself, or a wonderful bookish gift box.